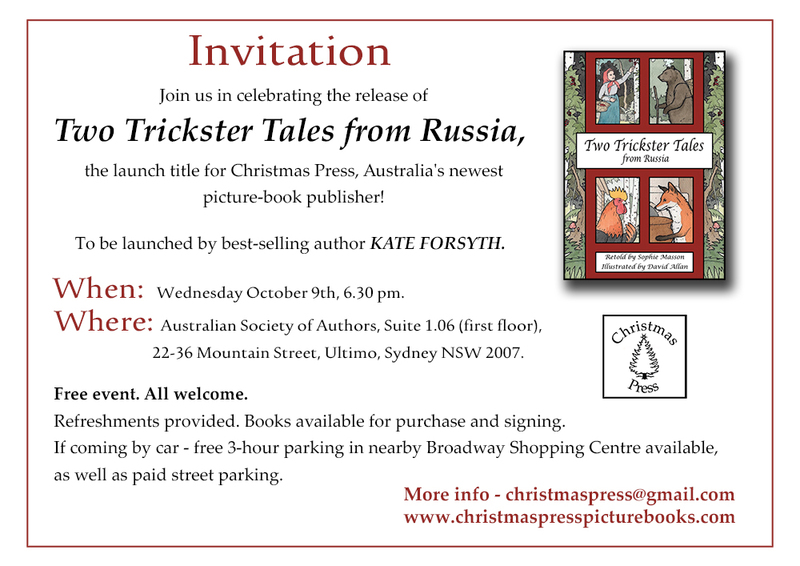 Yesterday, Saturday September 28, was the first official launch for both our gorgeous first book, Two Trickster Tales from Russia, and the Press itself! We had an absolutely wonderful afternoon with many friends and supporters at Fiona’s beautiful shop, Granny Fi’s Toy Cupboard in Uralla, northern NSW, with event management ably piloted by Granny Fi manager and Christmas Press Facebook publicist Beattie Alvarez. Award-winning author James Roy did the launch honours beautifully, our local State MP kindly took the time out from his busy schedule to pop in, the pink and white bubbly flowed, and everyone just loved the book and the beautiful limited-edition prints also on sale. A really warm and exciting official welcome to the book and Christmas Press in our region. Thank you very much to all who attended–we had a lot of fun too! Here are some pictures. Sophie Masson was interviewed today about Christmas Press and Two Trickster Tales from Russia on Kids’ Book Review, a popular children’s literature blog. Have a read! A lovely review by author Sue Bursztynski of Two Trickster Tales from Russia–the first one! And another one from reader and aspiring author Katrina Stewart, about both the book and the Press. The Express on the Press! 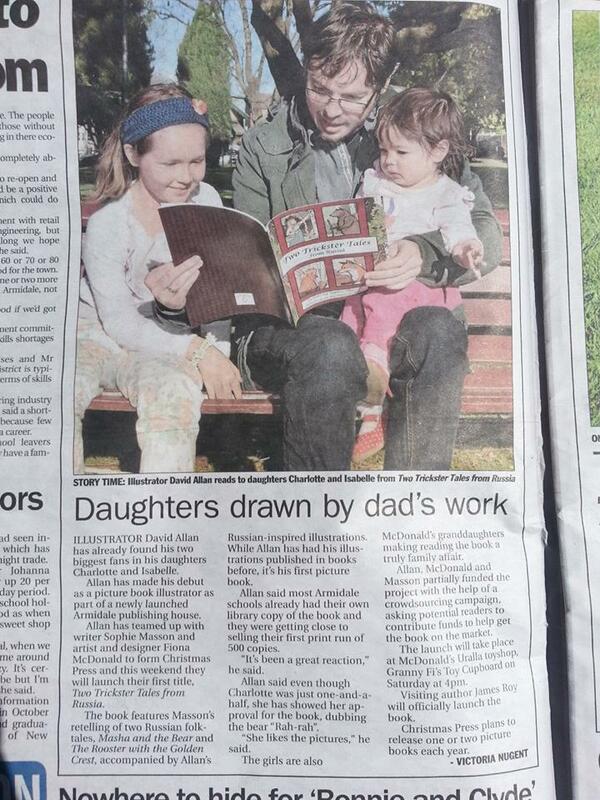 From our local paper, The Armidale Express. Here’s a piece about the story behind Christmas Press, as published on Stephanie Dowrick and Walter Mason’s Universal Heart Book Club blog. Here’s the text of an article about us published today, September 11, in the Australian Bookseller and Publisher magazine’s Weekly Books Newsletter, online. Article by Eloise Keating. A new Australian children’s book publisher called Christmas Press will specialise in publishing traditional folktales from around the world. Christmas Press has been founded by well-known children’s author Sophie Masson, illustrator David Allan and author and designer Fiona McDonald. The first title in the Christmas Press list, Two Trickster Tales from Russia by Masson and Allan, was published this month. An audiobook edition, which will include music and sound effects, will be released in time for Christmas. Two Trickster Tales from Russia features two Russian folktales—‘Masha and the Bear’ and ‘The Rooster with the Golden Crest’—accompanied by illustrations inspired by classic Russian children’s picture books. Christmas Press said in a statement that future Christmas Press titles will be based on folktales from other countries and written by different authors, with illustrations that are ‘reminiscent of the countries the stories come from’. Masson told Books+Publishing that the next Christmas Press titles will be published in 2014, with plans underway for two titles. ‘We really want to keep up the high standards we’ve set and that’s why we want to concentrate on a small list, at least initially,’ said Masson. At this stage, Christmas Press titles will not be available in digital format, as the Christmas Press team ‘feel that picture books work best as print books,’ said Masson. Masson said that the name Christmas Press was chosen as ‘“Christmas” conjures up not only a holiday time of celebration and family parties, but also of books given as presents and devoured over Christmas, and re-read again and again over the year’. Masson said that around 65% of the printing costs for Two Trickster Tales from Russia were raised through a crowdfunding campaign, ‘which was a huge help’ by generating pre-orders for the book and ‘some great promotion and publicity’. ‘It was simply wonderful to receive such great support from fellow creators and other people in the book industry, who were all as excited as we were about our project,’ said Masson. Booksellers can order Christmas Press titles directly from the publisher, while libraries can order directly from the publisher or through bookshops and library suppliers. For more information, visit the Christmas Press website here.